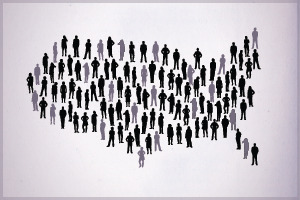 The so-called "Rise of the Nones" as been all over the news lately, thanks to new research released by the Pew Forum on Religion, which found that the number of US adults who claim no religious affiliation has almost reached 1 in 5, the highest in American history. Even more striking is the clear age correlation to the trend; younger generations have increasingly higher unaffiliated rates. That means that as the next decade or so at least progresses this number is sure to move from 1 in 5 toward 1 in 3, the current ratio for those between 18-29. Other key findings from the study include the historic new reality that Protestants make up less than half of Americans for the first time since the nation's founding and globally "Nones" now make up the third largest religious affiliation behind Christianity and Islam. Religious leaders have reacted in diverse ways to this news, ranging from: hand-wringing to hallelujahs! However you interpret it, one thing is clear...change is a comin'. The question I believe Christians must face is how to faithfully and humbly follow the way of Jesus in our new post-Christendom, post-Christian context. Okay, yeah but I'm not convinced it really means a post-Christian context. 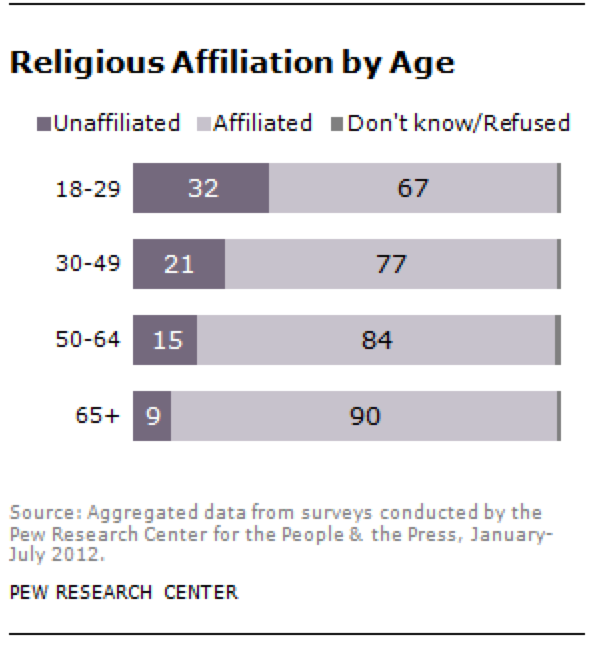 In my current research, two of the four young adults I'm working with identify themselves as both unaffiliated and "spiritual but not religious" -- a different but not unrelated identifier. But one is an adamant Christian who attends church every week, prays everyday, has a private practice informed by Christian ethics (his words); the other doesn't know what he believes and is likely to start visiting an Episcopal Church with his girlfriend...they decided that together after much conversation. So I'm not convinced this new research says a whole lot about the context in which we are seeking to discerning faithfulness other than perhaps that the way people hold their religious identities is complex. Actually most of these new studies lack the complexity we really need. Fair enough, Tim. Qualitative research such as you're doing is certainly needed to texture this picture. You're certainly right that the move toward disaffiliation is (very often) not straightforwardly a move away from spirituality or even predominantly theistic notions. That said, in as much as a "Christian" context is one in which self-identification as "Christian" is a social norm or advantage, it seems to me we're entering a post-Christian one...at least in on the coasts and in urban areas. No? What would you say it takes to make a place a "post-Christian" context? So a few thoughts come to mind. The first is that while I agree there might be some reasons to suggest Christian identity are less normative, I think it's more accurate to say they are becoming differently normative. Obama's Christian identity was still contested in 2008 (we can't have a non Christian President) and in 2012 Romney's Mormon problem was basically solved by asserting that Mornmonism is a part of Christianity (That's debatable for sociologist and theologians of course, but the public bought that). That's but one example but there are many. Second, it seems to me that actually part of what we *might* be experiencing is something like an authenticity check. By this I mean perhaps the question of affiliation is less about good/bad to belong, worth/not worth it, normative/not, but rather about a collective wondering about what it means to be church. I think collectively there is a growing sense in which we don't know. Some of the "nones" represent that ambiguity present in this moment. I would not want to confuse that faithful ambiguity with too strong an interpretation about the loss of religion (whatever that means) or the demise/loss of influence/social capitol/lack of faithfulness of the church. Third, I think we theologians need to be very careful here in our valorization of the past. My grandparents went to church every Sunday along with the entire town there in Pennsylvania Dutch Lutheran country because that's what you did. It was normative. Yet, they are almost entirely unreflective on most matters of faith. There is good reason to believe there are deep connections between normativity, social advantage and "settled" cultural systems unable to produce the kind of toolkit needed for improvisational faith. Finally just as a reminder to hold our meta discernment on the status of religion (ours or theirs or in general) lightly...Peter Berger once valiantly proclaimed the world was become more and more secular. He, along with others, had to retract that claim. With wisdom he did so often with humor, grace, and data.